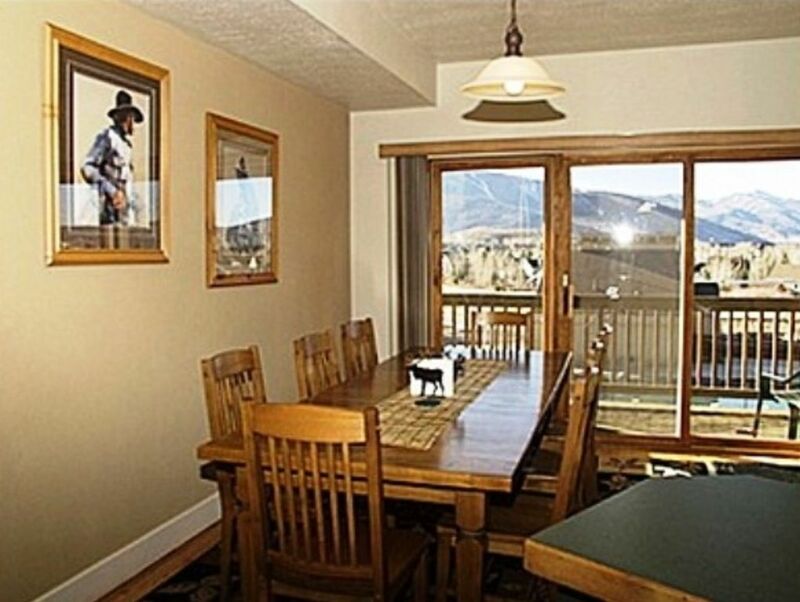 Park City Lights, Spectacular Mountain Views of the Rockies & Ski run from Park City Mt. Resort.. 3 Bedroom, 3 1/2 Baths , Private Hot Tub, 2 Fireplaces, 2 Living Areas, , Sleeps 8 to 12 ...with Queen Sleepers. in Gameroom Master has Private Balcony, Jetted Tub, Separate Shower, Double Vanity + Spacious Dressing Area . TV's, DVD's, Cable, WiFi access. Located in Prospector Area of Park City...Minutes to Ski Base at Deer Valley or Park City, and Minutes to Downtown Main Street for Dining, Galleries & Art Strolling. Close to Free City Bus. Steps to the Rail trail ...30 miles of biking, hiking, strolling or cross country skiing. Local Attractions : Utah Olympic Park, Viewing Luge & Bobsled along with Olympic Winter Sports Events. Nearby Town of Heber offers Scenic Mt. Train Rides. & Local treasures to discover. Winter Wonderland of Activities in this Olympic Town. At Olympic Park, take photos in a Bobsled & Luge. View Winter Olympic History. Fall offers Magnificent Foliage...watching the Aspens turn from Silver/Green to Golden, then Red Hues. Scenic Mountain Train Rides from nearby Heber into the Majestic Rockies. Art festivals, Wine fest, Historical Tours and special events year round. Located in the Canyon Crossing Townhome Complex. Grew up near the Ocean, Live in Texas...and Love to escape the flat lands & Heat of Texas Summers. Also Love to play in the Snow. Greatest Snow on Earth...is Utah's motto...and seems to be pretty accurate. Great skiing & Boarding! Pretty to just view as well. Olympic Park is exciting to visit....and very worth the visit. Art gallery strolls, Jazz & wine festivals add to the charm of this special Olympic Mt. Towm. Steam Train Rides next town over from Heber City. Greatest Snow on Earth....is a reality in this Picturesque Mt.Town. Park City is so convenient to Airport at Salt Lake City for ease of arrival & departure. Approximately 35 miles from airport to Park City. Property is Clean, Cozy, and Spacious for Families or couples. 3 1/2 Baths keeps getting ready for the day a bit easier.,& 2 fireplaces keep everyone warm & in front of a fireplace when desired. Truly love the Magnificent Views,Clean Mt. air & access to the 'Rail Trail' for hiking, biking, snowshoeing...or a stroll into town. Located close to free shuttle bus...and within 5 minutes to ski base at Park City & Deer Valley...or to Downtown Main Street for Dining, Shopping or Art Gallery Viewing. With lots of snow...can cross country ski ...or snow shoe to Mts. or to Downtown along the wonderful Rail trail..No Rails...just non motorized enjoyment. It was great for our group. Nice kitchen. Good amount of space. Would rent again. This townhome is a convenient and great place to locate in Park City. We had major issues with the sleep sofas(which is why I said only for 8) but I assume this has been rectified by now since it was reported to the owner. The facility is well supplied and the hot tub was great. Would rent there again. Working on the noted... and hope to have sofa mattresses replaced as soon as possible . Thank you for choosing our Vacation Home. We've been staying at this wonderful townhouse for quite a few of the past several years. We keep coming back as we so love this townhouse and the Park City area for wonderful dining, adventure, relaxation, and skiing at Deer Valley and Park City. The townhouse is spacious with two living area, two fireplaces, three bedrooms, and plenty of bathrooms. It feels like him! Our family enjoyed our stay,plenty of room to gather or have quiet space. We had a couple of technical glitches but the owner was very responsive to fix them. Beautiful views from of the mt. Thank you for staying with us...sorry the response went unnoticed. We have been replacing items as needed, and adding inventory. Have a Healthy & Happy New Year! My family loved this place! It's cute, comfortable, clean and has lots of sleeping space for a group. The kids loved that they had their own space and bathroom in the den area (the parents and grandparents loved that they had their own space too :-)). The house is close to Old Town Park City and the ski slopes. We will definitely come back! And thank you for review too. We had a wonderful time in the condo. It was well appointed for all of our needs. We had a group of young adults stay in the basement with the fold out sofas and bunk beds, Grandma and Grandpa upstairs and our sister and brother -in-law along with us in the other two bedrooms upstairs. We were in Utah for our sons wedding and to enjoy some skiing. There was lots of space for all 10 of us. We even had an extra few a couple of nights and made out just fine. The only suggestion was that the sofa beds were very uncomfortable so the two guys took one each and slept on them as couches. Not ideal but it worked. We had brought our own inflatable queen bed in case and used that a couple of nights as well. Elandra was very good at making sure we were well taken care of and checked up on us with a phone call during our stay to ensure things were going well. I would recommend this unit and would stay again if in the area. Hard to believe a year has gone by and it recently was the Bride & Grooms" 1st Anniversary. Hope all is well, and looking forward to a Healthy, Happy 2017 for you and your loved ones. Best Powder Snow...Park City, Mt. Resort, Deer Valley (in Park City)& The Canyons......now connects to Park City Mt. Resort. Very much worth the Visit!